To mark the 30th anniversary of Postman Pat a new CGI 3-D movie is being released entitled ‘Postman Pat: The Movie – You Know You’re the One’. Timeless Films are managing worldwide sales with Icon Films Distribution releasing the movie in the UK. Actor Stephen Mangan does the Postman Pat character and the movie co-stars Rupert Grint (Harry Potter’s Ron Weasley) and David Tennant (the 10th Doctor Who). You Know You’re the One sees Pat tempted away from the simple pleasures of Greendale by fame and fortune as he enters a TV talent show. 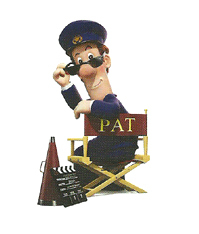 The movie release, as well as Pat’s 30th birthday, are sure to generate even greater merchandising opportunities so look out for Postman Pat anniversary and movie toys.